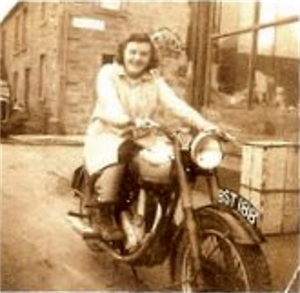 Gertrude MacKay on Shore Road, maybe outside Rhind's Shop. The date is unknown. Yes looks like the corner of King Street and Shore Road. Hi Harry. You can see the Crest above the door to the customs office which was on the corner of Shore Road and King Street. The glass window was one of the Naval Outfitters which later got taken over by the boat builder. Hi Eddie, thanks, yes re the customs house. I think Rhinds were here prior to moving up to Bank Street to old Charlie Pandrops store. Also Gertrude used to work at Rhinds. That was Rhind's first shop before going to Bank Street - notice the orange box.